Thanks to County Executive Ike Leggett for responding to my post on how his administration ignored my proposal to make up revenue for the Department of Liquor Control (DLC). I stand by my piece and reply to several of his points as follows. 1. Contrary to the Executive’s contention, my proposal was in fact never analyzed during the time of the DLC task force. His consultant’s report never mentions it despite the agreement of his staff to include it. Try finding my proposal, my name, a reference to Seventh State or an analysis of my idea for using cable funds to finance DLC’s debt in the report. They are simply not there. 2. The Executive alleges that I made a “basic math mistake” by omitting DLC’s debt service from the revenue needing to be replaced. Not at all. 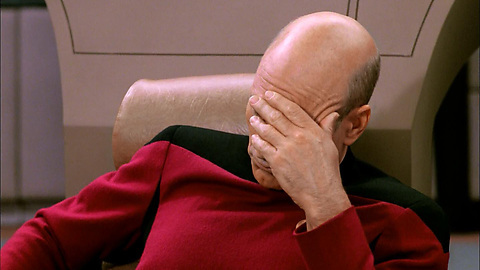 Anyone reading my proposal can see that I did not omit it. I simply dealt with it separately from the return DLC sends to the operating fund since the two revenue streams require different fixes. 3. The Executive is correct that the state has imposed numerous unfunded mandates and fees on the counties in recent years. I should know. I helped organize a campaign against the teacher pension shift in 2012 that included county governments, school boards, community groups and elected officials in both parties. But rather than merely complain about the state, let’s recognize that it has a role to play in dealing with the liquor monopoly and the revenue question since DLC was created in state law. A visionary Executive with a plan to transition away from the liquor monopoly would be invaluable in securing the state’s cooperation. 4. The Executive is wrong about my proposal to use cable funds to service DLC’s debt in two ways. First, he claims that I proposed raising the 5% fee the county currently levies on cable bills. That’s not what I said, and in any case, the fee is already at the maximum level allowed by federal law. Second, he claims that “Cable fund money cannot legally be used for purposes other than cable-related needs: technology and communication purposes. We cannot take Cable Funds to build roads and schools.” That is absolutely wrong. The county’s own cable lawyer advised the County Council in 2012 that the county has discretion over how the 5% fees can be spent, but not on amounts collected over that level or on behalf of municipalities. Those amounts not subject to county discretion were excluded from my analysis. In fact, the Executive transfers some money from the cable fund to the general fund right now. The approved FY17 budget states, “Funds are transferred from the Cable Fund to the General Fund to cover the cost of certain administrative services provided by the County to the Cable Fund ($654,353) and other contributions ($5,163,433).” That’s right, folks, the Executive’s statement in his reply to us is contradicted by his own budget. Why is the Executive so resistant to the idea of using cable funds for DLC’s debt service? Perhaps one reason is because cable fees are the source of millions of dollars for County Cable Montgomery and Montgomery Community Media, two public “news” outlets that provide “coverage” for county elected officials. Try to locate an unflattering “news” article about county elected officials in any of the “coverage” provided by these outlets. Good luck finding any because one of them is part of county government and the other is a non-profit that gets more than 80% of its budget from the county. What’s the better use for this money? Financing Pravda-style public relations or helping to fix the liquor monopoly? 5. The Executive notes that Worcester County’s former monopoly on spirits may be coming to an end. He is probably right about that. Worcester’s monopoly, while not including wine and beer as Montgomery’s does, did an even poorer job of customer service than MoCo and was busted by the Comptroller for breaking numerous laws in 2010. After Worcester’s monopoly was opened to competition in 2014, the county lost 42% of its wholesale business after a year (while keeping 96% of its retail volume) and its leaders may decide to exit alcohol sales altogether. But if they do so, it will be because they have decided they can’t compete with private distributors. That seems to be the rationale the Executive has for shielding DLC from competition: since (in his view) it can’t compete, competition shouldn’t be allowed. How is that a good thing for licensees and consumers? Isn’t there a chance that open competition could cause DLC to improve while making private wholesalers pick up their game? 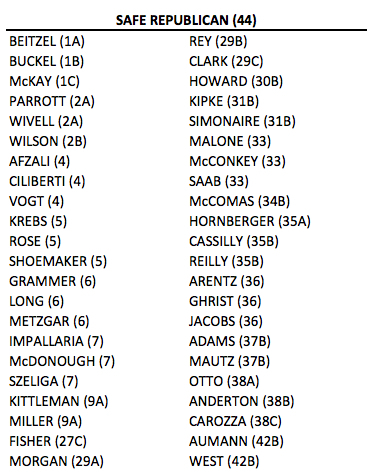 Also, the Executive says, “In the liquor business it is the suppliers/manufacturers who decide which ONE distributor/wholesaler will sell their products.” That may be true under most circumstances in Maryland, but COMAR 03.02.01.12 exempts county liquor dispensaries from this arrangement. In other words, state law allows manufacturers to sell to both county liquor sellers and private distributors. That is what happens now. In fact, DLC couldn’t exist without this exemption. Competition between DLC and the private sector can occur if the state allows it. The Executive simply opposes it. The County Executive’s response shows that he is sensitive to criticism on this subject. If only that were enough to make real progress on the county’s shameful liquor monopoly. Adam Pagnucco’s blog entry, Setting the Record Straight, does anything but set the record straight. Let’s be clear – I did not “throw in the towel” on privatizing the County’s Department of Liquor (DLC). The record clearly shows that I introduced State legislation that would have privatized our DLC while also protecting and maintaining the significant revenue stream of over $30 million a year it contributes to the County budget. Some on our County Council and in the State Delegation felt that, given the progress we’ve seen in DLC since we brought in a new management team with considerable liquor industry experience, and a number of substantive changes we had made to the organization already, we should give them additional time to make even greater improvements. Philosophically, I am not opposed to privatization, but I also stand by my statement that not one of the critics of the County’s Department of Liquor Control (DLC) put forth a viable privatization proposal that would hold the County budget harmless by replacing the DLC’s profits. The County DLC is a taxpayer asset that produces a net profit of over $30 million a year and to privatize without replacing the revenue would be a disservice to our taxpayers. After months of soliciting proposals, not one person or organization offered a viable plan to privatize DLC while maintaining the approximately $30 million in profits, including groups that assured us they would. While Mr. Pagnucco claims that his plan would have done so, his route to privatization, simply put, was based on faulty assumptions. First, Mr. Pagnucco made a basic math mistake. He estimated that the County receives $20 million in “profit” in FY17, therefore starting with the faulty premise that to make the County whole, only $20 million in DLC profits each year need to be replaced. Unfortunately, he ignores that in FY17, the Department of Liquor Control earmarked $20.7 million for transfer to the General Fund and another $10.9 million to pay debt service on Liquor Bonds – bonds that have paid for road, and school construction in our County. Therefore, the revenue to be replaced equals $31.6 million, not $20 million. Mr. Pagnucco’s proposal then makes the argument that there will be a huge economic spinoff from privatizing by increased sales. He relies on a report done by the Comptroller’s Bureau of Revenue Estimates, which was itself built on an amazing number of alternative facts. But, for the sake of argument, say it was a sound analysis. Even Mr. Pagnucco admits that the tax revenue estimates presented in the report actually proves the county’s point that opening the alcohol market really only benefits the State coffers. He himself noted the county would receive less than $1 million of the revenue, while the rest of the estimated $35 million in economic spinoff benefit would go to the state’s general fund. Mr. Pagnucco claims that the County can replace the bond money by raising our cable franchise fee and siphoning off dollars from the Cable Fund. With this statement he negates his own argument that his proposal would be “cost neutral” since it would in fact require raising fees. But what he more importantly failed to realize is that Cable fund money cannot legally be used for purposes other than cable-related needs: technology and communication purposes. We cannot take Cable Funds to build roads and schools. Plus, utilizing this revenue would just create a budget hole elsewhere. Another faulty assumption in Mr. Pagnucco’s proposal is using Worchester County as an example of how privatization in Montgomery County would work smoothly. He claims that after privatizing its liquor business, Worchester experienced reduced revenues but that the loss was negligible and that such a loss would equate to a mere $5 million per year for Montgomery. However, in reality, the unhappy ending to the Worchester story of privatization is that Worchester County is now going out of the liquor business forever and will generate exactly zero revenue for its budget in the future. The final faulty assumption in Mr. Pagnucco’s proposal is his assumption that the county could just open up more liquor stores, which he notes would create additional profits. See paragraph above: Worchester’s unhappy ending is testament that it just won’t happen. Finally, Mr. Pagnucco says he was not proposing getting rid of the DLC – he just wanted to provide competition (i.e. ; “end the monopoly”) by allowing our licensees to decide from whom to purchase products. But that’s not how it works. In the liquor business it is the suppliers/manufacturers who decide which ONE distributor/wholesaler will sell their products. The so-called monopoly doesn’t end, it simply transfers from the County to the private sector. Why turn over this asset that belongs to our county residents to the private sector for nothing? We should be looking forward, not back. The DLC is, as they say, under new management. It has a new director, and is on course to continue making positive changes to improve operations and customer service. Can we please stop pretending that Gov. Larry Hogan is a swell bipartisan guy? Larry Hogan has been railing against gerrymandering in Maryland for some time. So it should have been an easy lift when seven Democratic U.S. House members asked him to support national redistricting reform. Hogan turned them down flat. If Hogan was really cared about fairer methods of drawing congressional districts, he would have said he’d be glad to do it. Or, at least, that he would be happy to support their bill for national reform if they’d support his efforts in Maryland. But not our Larry. If you didn’t get the message, his public comments made crystal clear that Hogan only cares about redistricting reform because he thinks it will benefit Maryland Republicans. As he turned down national redistricting reform, he touted that several Democrats could “lose their seats” under his proposed reform. This is part of a larger Republican pattern. Republicans fought redistricting reform tooth and nail in Arizona, trying to get the initiative overturned in court and then suing to overturn the plans passed by the nonpartisan commission. In Florida, a court recently imposed a new plan to overturn a gerrymander enacted by Republicans in violation of a reform initiative. Republicans have enacted congressional gerrymanders in major states like Pennsylvania, Michigan, North Carolina, Ohio, and Texas. In contrast, Democratic California has a reformed commission system. New York Gov. Andrew Cuomo pushed through a redistricting reform that will go into effect with the next census. A rare bright spot for bipartisanship was acceptance by both parties of a reform plan for the state legislature (but not Congress) in Ohio. Republicans like Hogan favor redistricting reform in Maryland not because it is generally the right thing to do but to gain advantage. Put another way, our governor cared enough go out of state to campaign for Chris Christie for president but he can’t be bothered to support national redistricting reform because that is a “federal” issue. As when he threw his public tantrum to defend Trump, Hogan has shown his very partisan colors. It’s really time that the press and commentators stopped pretending otherwise. On August 15, 2016, while the Executive’s DLC task force was meeting, your author posted a proposal on Seventh State for replacing DLC’s profits. Our concept was to replace every dime of DLC’s net income with a combination of revenue sharing with the state, opening a few new liquor stores and financing the county’s liquor bonds with cable funds. No new taxes or fees would be required. In the email below, your author asked Bonnie Kirkland, the Executive Branch staffer running the task force, to have the proposal studied by the administration’s consultant. Ms. Kirkland agreed to do that. But the consultant’s report never examined our proposal and does not reference it at all. And now the Executive claims that our proposal never existed. Let’s give the Executive the benefit of the doubt. No Executive is aware of every interaction his staff has with the public. But it’s absolutely untrue that we had no proposal to replace DLC’s profits. We did and we shared it with his staff. It was simply ignored by his administration. Below is the email exchange your author had with Ms. Kirkland as proof. Let no one – not the Executive, not his staff, not anyone at the County Council and not anyone else – continue to claim that we presented no ideas for replacing DLC’s profits. Adam – The proposal, along with the others, is under analysis by the consultant. They will present a preliminary report/analysis at the next meeting, September 15. Adam – Yes, I did receive your email. I am currently out of the office and will respond as soon as possible. Hi Bonnie – did you receive this email? And if so, can you confirm that this proposal will be analyzed along with the others in the course of the DLC task force’s deliberations? I am requesting that this proposal on how to deal with liquor monopoly revenue be considered by the administration as part of its DLC deliberations. Today, we take a peek at the two most vulnerable Republicans in the House of Delegates. Parts I and II in this series already outlined the safe Democratic and safe Republican seats. Robert Flanagan is the most vulnerable Republican in the House of Delegates. Representing District 9B in Howard County, Flanagan beat Democrat Tom Coale with 55% of the vote in 2014. Flanagan ran behind Larry Hogan, who beat Anthony Brown in the gubernatorial race by 16 points. The district shifted back heavily to the Democrats in 2016 as Hillary Clinton defeated Donald Trump by 19%. If a backlash wave against Trump upsets Republican boats in the General Assembly, this is one of the first places that will be hit, as it holds many of the precise sorts of voters who tend to be ticked off by Trump’s antics. Flanagan has $18,268 in his campaign kitty according to the report he filed in January. In this wealthy county, he is likely going to want to raise a lot more before the campaign. Howard’s trend toward the Democrats stalled in 2014 but Flanagan still goes into the 2018 elections with a big target on his back. Del. Herb McMillan is one of those politicians who has been on the ballot for many years but always has close, and sometimes losing, races. He won the third slot the House from District 30 in 2002 by just 427 votes over his Democratic opponent. McMillan ran for the Senate in 2006 and lost with 47% against Sen. John Astle. He must have been happy to win a return ticket to the House of Delegates in 2010. But his vote share, the equivalent of 51% in a single-member district, hardly discouraged challengers. Redistricting placed him in District 30B, a subdistrict that he shares with Democratic Speaker Mike Busch. Undoubtedly, Busch hoped that the voters would send McMillan home from the redrawn district. However, in the same year that Hogan won the seat by 18%, McMillan surprised and came in ahead of Busch with the equivalent of 56% of the vote. Despite coming off of his best race ever, McMillan remains at risk. Like Flanagan, McMillan represents a seat that Hillary Clinton won convincingly. Though Anne Arundel County split nearly evenly, Clinton won this portion by 15 points. McMillan is more prepared than Flanagan with a $66,817 in his campaign treasury–good evidence that he is ready to run a tough race for this or the Senate. Even if Hogan does well, there will be no anti-Democratic backlash to aid McMillan this time as a highly controversial Republican sits in the White House. Either way, Democrats will want to recruit strong candidates here and in Flanagan’s district to bring the fight to them in the hopes of padding their majorities or offsetting losses elsewhere. School construction has been one of the hottest issues for years in Montgomery County. Enrollment in Montgomery County Public Schools (MCPS) has been increasing by close to 2,000 students a year for a decade with no sign of stabilizing. The result is crowded schools throughout the county. According to the Superintendent’s FY18 Recommended Capital Budget, 109 of MCPS’s 197 schools were over capacity in the 2016-2017 school year. Of those, 35 had enrollments of at least 120% of their capacity. Even if the Superintendent’s request is fully funded, by the 2022-2023 school year, 87 schools will be over capacity and 29 will be at least 120% capacity. Overcrowding will continue because construction will not keep pace with enrollment, which is projected to grow by nearly 10,000 students over that period. MCPS is using 388 relocatable classrooms this year, a number that has not changed much over the last five years despite significant spending on school construction. Over 80 percent of MCPS school construction costs are paid by county taxpayers with the remainder coming from state aid. Here are five facts about school construction that all MoCo residents should know. MCPS enrollment is growing faster than the rest of the state COMBINED. 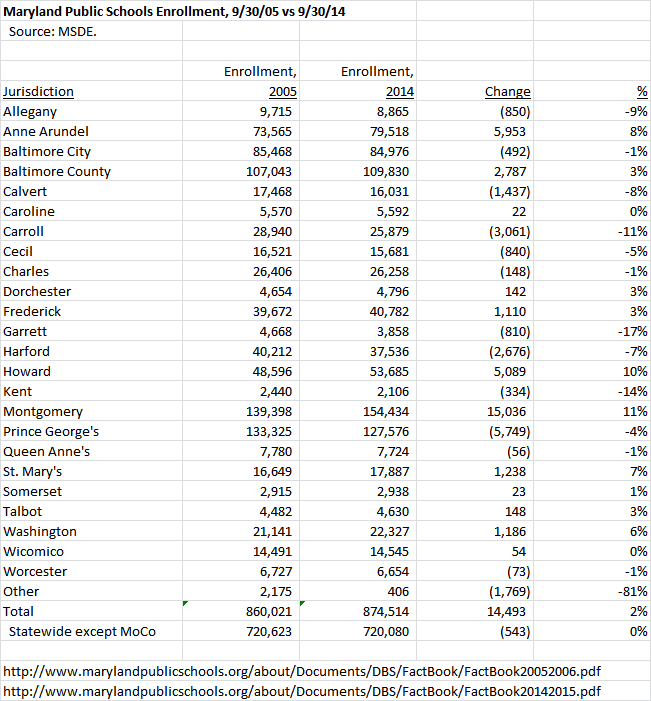 According to the Maryland State Department of Education, September enrollment in MCPS grew by 15,036 students between 2005 and 2014. Over that period, public school enrollment in the rest of Maryland SHRANK by 543 students. MCPS’s absolute increase and its growth rate (11%) were both first in the state. Other systems are growing too (notably Howard and Anne Arundel) and all counties have maintenance requirements. But in terms of new capacity needs, MCPS is in a category of one. MoCo gets less school construction money from the state per student than all but a handful of other counties. Over the five-year FY13-17 period, MoCo received $201.7 million in state aid for school construction, just ahead of Baltimore County and tops in the state. That’s a substantial amount of money. 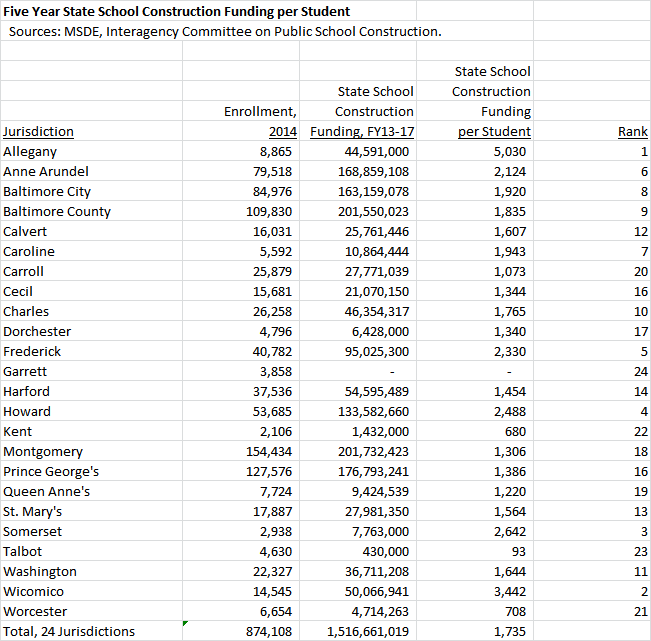 But relative to its September 2014 enrollment, MoCo’s construction aid per student ($1,306) ranked 18th of 24 jurisdictions. MoCo had 18% of the state’s public school students but received just 13% of state construction dollars, the biggest gap in the state. The state’s funding formula discriminates against school construction in MoCo. The state finances a percentage of eligible costs for school construction projects approved for state aid with the local jurisdiction paying the rest. MoCo is one of seven jurisdictions for which the state covers 50% of funding for school projects approved by the Board of Public Works, the lowest rate available. Other jurisdictions including Prince George’s (63%) and Baltimore City (93%) receive much higher cost splits. State legislators from the City of Baltimore extracted a billion dollars from the state for their school construction program. In 2013, Governor Martin O’Malley and the General Assembly’s presiding officers made passing a revenue increase for transportation a high priority. Despite the fact that one of the projects to be funded was Baltimore’s $2.9 billion light-rail Red Line, city legislators withheld their votes until they got more money to rebuild their aging schools. (City school enrollment fell between 2005 and 2014.) The result was a new seven-year billion-dollar state aid program for city schools that greased the wheels for the transportation funding hike. The city delegation’s work shows that significant progress can be made on this issue. MoCo residents are now paying a new tax hike in part to fund school construction. Last May, the Montgomery County Council approved a recordation tax increase on home sales projected to raise $196 million over six years. The council justified the tax hike on the grounds that $125 million of the money was supposed to be spent on school construction. No recent media reports indicate that any other Maryland county has raised local taxes for the explicit purpose of financing school construction. Disclosure: Your author’s son attends Flora Singer Elementary School in Silver Spring. Despite opening just four years ago to relieve overcrowding at nearby Oakland Terrace, the school is already over capacity. Maryland Democrats have been trying to link Gov. Larry Hogan to Donald Trump. Now, Hogan has done it for them. Following his pattern of avoiding all politically touchy issues when at all possible, Larry Hogan refused to comment on Trump’s travel ban because it is “the sole purview of the federal government.” An interesting view expressed by the same guy who proudly declared that Maryland would refuse to accept Syrian refugees. Among other issues, the ban resulted in a 5-year old Maryland boy being separated from his mother and held for hours. Hogan continued his pattern of avoidance by not responding to Attorney General Brian Frosh’s request to sue the federal government on this issue. No doubt Hogan thought this was a clever way to say no while saying nothing, but Frosh upped the ante by taking Hogan’s silence as permission. Hogan’s silent freeze out ended in a tantrum when the General Assembly voted to give Attorney General Brian Frosh the authority to sue the federal government on this and other issues. Article V of the Maryland Constitution permits either the Governor or the General Assembly to give the AG license to sue. No change in rules. Just take a moment to read the Maryland Constitution. Don’t get mad when the Assembly exercises its rights just because you chose duck and cover. Again, remember that for Hogan, Syrian refugees are a Maryland problem but detained child is “federal issue.” Quite a change from when Obama was president. Republicans in the Maryland Senate joined the tantrum by walking out during the discussion of the bill. The Governor and Maryland Republicans have now taken a firm stand in favor Trump and his policies. While the Governor tried to dodge, he ultimately strongly fought the Assembly’s decision to allow AG Frosh to oppose them, breaking his much vaunted amity in order to vocally support the Trump ban along with plans to dismantle environmental protections and take away health care from thousands of Marylanders.